...Journeying Up the Mountain of God: "Are You Standing Your Post?" “Be on your guard; stand firm in the faith; be men of courage; be strong.” (1 Corinthians 16:13) Going through the “volumes” of ministry networking emails which I receive daily, I came across an email with a heart-touching story which I had not heard in the news. It seems that when Hurricane Isabel was bearing down on Washington, DC in September 2003, an understandable panic/fear struck many hearts for the dangers such a storm posed! The federal government shut down along with area schools long BEFORE the storm even arrived. But a different response of character was taking place at Arlington National Cemetery (ANC)—“home” to 260,000 valiant veterans. ANC is also the site of the Tomb of the Unknown Soldier which was built in 1921 to honor those who died for our country and it holds the remains of an unidentified fallen soldier. 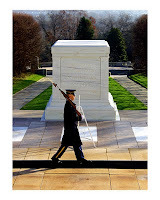 The Tomb is watched/guarded 24-hours-a-day, 365 days a year by the 3rd U.S. Infantry Regiment, known as “The Old Guard.” Cemetery officials found themselves in a dilemma with Hurricane Isabella bearing down on the Capitol area. As this fierce storm approached Washington, DC area with sustained winds of 75 mph and torrential rain, the cemetery officials gave The Old Guard permission to leave their posts for “safety sake.” However, the soldiers refused to leave – they never abandoned their post guarding the Tomb! Staff Sergeant Alfred Lanier said the Tomb was something “we cherish.” Sgt. Christopher Holmes said leaving the Tomb is “never an option for us” and added he was prepared to die while guarding it. Just as President Eisenhower asked when he surveyed the bravery on the beaches of Normandy in WW II, “Where do we get such men?” As I read that story, I couldn’t help but think about Christians who have been willing to lay down their lives for the sake of the Cross of Christ despite all types of dangers / risks. But what does it really mean to “lay down your life?” It means to lay aside personal plans, selfish desires and worldly ways/plans so as to pursue God’s divine purposes for your life. 1 John 3:16 echoes this truth—“This is how we know what love is: Jesus Christ laid down his life for us. And we ought to lay down our lives for our brothers.” The question before the Church today—God’s people—is simple: Are we staying at our ministry posts amidst today’s spiritual and moral storms, or are we abandoning our God-appointed positions, surrendering to fear instead of valiantly serving in the Savior’s shadow? When today’s world looks at the church, do they see men and women of honor, valor and integrity in their lives of faith? God’s Word encourages every believer to stand firm (1 Corinthians 15:58) at their ministry posts today amidst the ever-increasing pressure to flee from intensifying battles! So from this day forward, let us all commit to be Christ’s Soldiers of Honor/Valor as we sacrificially serve Him through serving others around us in this life’s journey! …Selah! Today's Spirit-led CCM video by Aaron Shust be viewed by clicking on the song title, "My Savior My God" - G3 for sharing His power-filled words through so many CCM songs today!